Du, J. and Koffman, E. E. (2017). Labeling Aversive Memory Trace in Mouse Using a Doxycycline-inducible Expression System. Bio-protocol 7(20): e2578. DOI: 10.21769/BioProtoc.2578. A memory trace, also known as a memory engram, is theorized to be a mechanism for physical memory storage in the brain (Silva et al., 2009; Josselyn, 2010) and memory trace is associated with a specific population of neurons (Liu et al., 2012; Ramirez et al., 2013). Labeling and stimulating those neurons will activate the memory trace (Liu et al., 2012; Ramirez et al., 2013). Memory appears to be spread over different regions of the brain rather than being localized to one area. Therefore, the methods used to trace memory have the ability to improve our understanding of neuronal circuits. In this protocol, we introduce a doxycycline-inducible expression system to label the specific neurons associated with the original memory trace. Memory trace is a theoretical means by which memory is stored as a physical or biochemical change in the brain (Ryan et al., 2015). After the concept of memory trace was formulated by German zoologist Richard Semon at the turn of the twentieth century, the specific process involved in memory storage has been an unsolved topic of debate in the field of neuroscience (Poo et al., 2016). Although the mechanism of memory has been a topic of debate for decades, there has been agreement that specific neurons are utilized in the storage of memories (Liu et al., 2012; Ramirez et al., 2013). In addition, it is believed that memory is not localized to one area, but is instead a mechanism that takes place over many different regions of the brain. Early researchers used a combination of behavioral and surgical approaches to identify memory traces (Bruce, 2001). Although we have learned much from these behavioral and surgical approaches, these methods have not provided us the ability to visualize or identify the target neurons used within a memory trace. In the brain, the expression of immediate-early genes such as Fos, is rapidly upregulated in the specific neurons that are associated with learning and memory formation. Recent studies addressed this issue using the mouse TetTag-Fos driven-GFP mouse model (Reijmers et al., 2007) combined with an adeno-associated virus (AAV9) encoding a TRE-mCherry (Liu et al., 2012; Ramirez et al., 2013). In the interest of continuing the work of identifying target neurons involved in memory trace, we generated Fos-tTA mice from TetTag mice by breeding them with C57BL/6J mice and choosing those that carry only the Fos-tTA transgene. The Fos-tTA mice have Fos promoter-driven expression of nuclear-localized, 2-h half-life EGFP. The Fos promoter also drives expression of the tetracycline transactivator (tTA), which can bind to the tetracycline-responsive element (TRE) site on an injected AAV9-TRE-mCherry virus, resulting in the expression of mCherry. In the Fos-tTA mouse system, application of doxycycline (Dox) inhibits binding of the Fos promoter-driven tTA to the TRE site, preventing target gene expression. 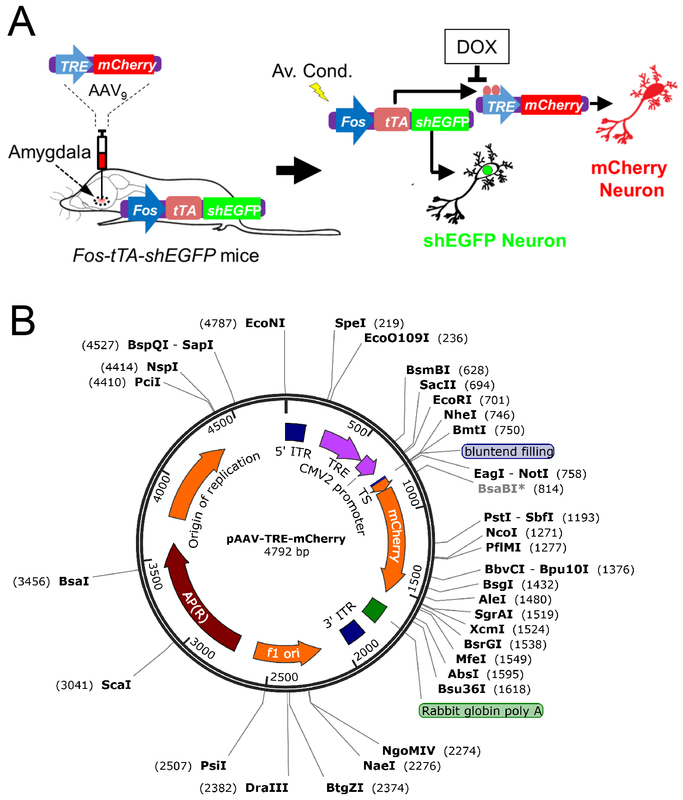 We inject the AAV9-TRE-mCherry into the amygdala of the Fos-tTA mice. In the absence of Dox, aversive conditioning activates Fos driving mCherry expression in the targeted neurons (Figure 1). We recently employed this technique to determine if CO2/ASICs enhances the memory trace during retrieval (Du et al., 2017). Other studies have utilized the approaches to identify the specific memory engrams and re-activated it using optogenetics (Liu et al., 2012; Ramirez et al., 2013). In summary, this is a powerful technique to identify a memory trace and will strongly benefit the future study of neuronal circuits, learning, and memories. Figure 1. Schematic showing how neurons are labeled in mice transgenic for TetTag Fos-tTA and microinjected with the viral vector AAV9-TRE-mCherry. A. Neuronal activity activates the Fos promoter. The Fos promoter drives expression of the tetracycline transactivator (tTA) and shEGFP. The shEGFP protein is rapidly degraded with a 2-h half-life. The tTA protein binds to its target, the tetracycline-responsive element (TRE) site on the microinjected AAV9-TRE-mCherry construct, resulting in the expression of mCherry in neurons. The presence of Dox inhibits tTA from binding to the TRE and thus prevents the expression of mCherry. B. The vector map showing how the pAAV-TRE-mCherry plasmid was constructed. AAV9 viruses containing the construct was packaged by the University of Iowa Gene Transfer Vector Core. The vector map was generated by SnapGene 4.0. Manufacturer: Exel International, catalog number: 26706 . Manufacturer: Reynolds Consumer Products, catalog number: 632 . Note: Mice are group housed before and during the experiment. Note: Aliquots should be stored at -80 °C. Note: Stored at 4 °C. Note: Aliquots should be stored at -20 °C. Manufacturer: Sklar Surgical Instruments, catalog number: 642035 . Note: Animal care and procedures met National Institutes of Health standards. Local animal care ethical standards must be adhered to. The University of Iowa Animal Care and Use Committee (ACURF #4041016) and the University of Toledo Institutional Animal Care and Use Committee (Protocol #108791) approved all procedures. The TetTag Fos-tTA mice are generated from the B6.Cg-Tg (Fos-tTA,Fos-EGFP*)1Mmay/J mice by breeding them with C57BL/6J mice and choosing those that carry only the Fos-tTA transgene (Liu et al., 2012; Ramirez et al., 2013). The University of Iowa Genome Editing Core Facility provides mouse genotyping service. The genotyping protocols can be found at https://www.jax.org/strain/018306. Figure 1 shows how neurons are labeled in mice transgenic for TetTag Fos-tTA and microinjected with the viral vector AAV9-TRE-mCherry. Figure 2. Schematic showing the procedure of labeling the memory retrieval-induced activation of lateral amygdala neurons in the aversive memory trace. A. Mice are fed Dox for 1 week, and then an AAV9 vector encoding mCherry is microinjected into the amygdala. Dox inhibits mCherry expression. Two weeks later, Dox is discontinued, and mice undergo the aversive conditioning protocol. Under those conditions, the Fos promoter will drive both shEGFP and mCherry expression, but shEGFP will rapidly decay. After aversive conditioning, mice immediately resume Dox treatment. One day later, the mice undergo the retrieval protocol. Thirty minutes after that, brain slices are prepared and the shEGFP- and mCherry-positive neurons in the lateral amygdala are determined. B. The stereotaxic system for the surgery of virus injection. Twelve-week-old mice are fed Dox diet (40 mg/kg) for one week before surgery. Sterilize the surgery area, instrument, and materials. Mice are anesthetized using ketamine/xylazine cocktail (see Recipes, 0.1 ml/20 g mouse weight. Intraperitoneal injection) or inhaling 1.5% isoflurane driven by 100% oxygen through an anesthesia machine vaporizer. Note: Ketamine/xylazine may cause animal death after surgery. Using an anesthesia machine vaporizer is an ideal option. Before surgery, use 2.5-3.5% isoflurane to anesthetize the animals and then lower down the concentration to 1.5% during the surgery. Shave the surgical site using an electric clipper and sterilize the site using iodine wipes and alcohol pads alternatively. The skin is opened using a blunt-ended scissors. Then a small hole is made using a high-speed rotary micromotor drill with a sterile diamond burr grinding bit. In the presence of Dox, 0.5 µl AAV9-TRE-mCherry virus is injected vertically (90° to the skull) into the lateral amygdala bilaterally (relative to the bregma: -1.5 mm anteroposterior; ± 3.5 mm mediolateral; -4.3 mm dorsoventral), using a 10 µl Microliter 700 series syringe through a microsyringe pump (UMP3; WPI) (Figure 2B). A stereotaxic microscope is used for the microinjections to the mouse brain. The injector is slowly moved to the targeted site and should sit for 5 min before starting virus injection. A microsyringe pump (UMP3; WPI) with a controller (Micro4; WPI) are used to control the speed of the injection. The speed is set as 0.1 µl per minute. Note: The needle tip is easily clogged by dirt after injection. Clean with water and alcohol each time after use. The needle remains at the site for 5 min after the end of injection. Slowly extract the microsyringe from the site and mouse brain. Note: The microsyringe and needle are wiped with alcohol pads and rinsed with sterile ddH2O after injection. Glue the skin with Vetbond. After surgery, mice are housed in their home cages collectively and monitored for two weeks until behavioral testing. The mice will be given Dox diet during the two weeks prior to the behavioral testing. Anesthetics, Meloxicam and Buprenorphine, are administered to the mice before surgery. Meloxicam is given again 24 h later, and Buprenorphine is given every 12 h for a total 48 h of treatment. All sites of virus injection are verified histologically based on the immunostaining results after the behavior testing. All the behavioral experiments are performed at the light cycle. Mice are handled for 30 min on each of 2 days before aversive conditioning. 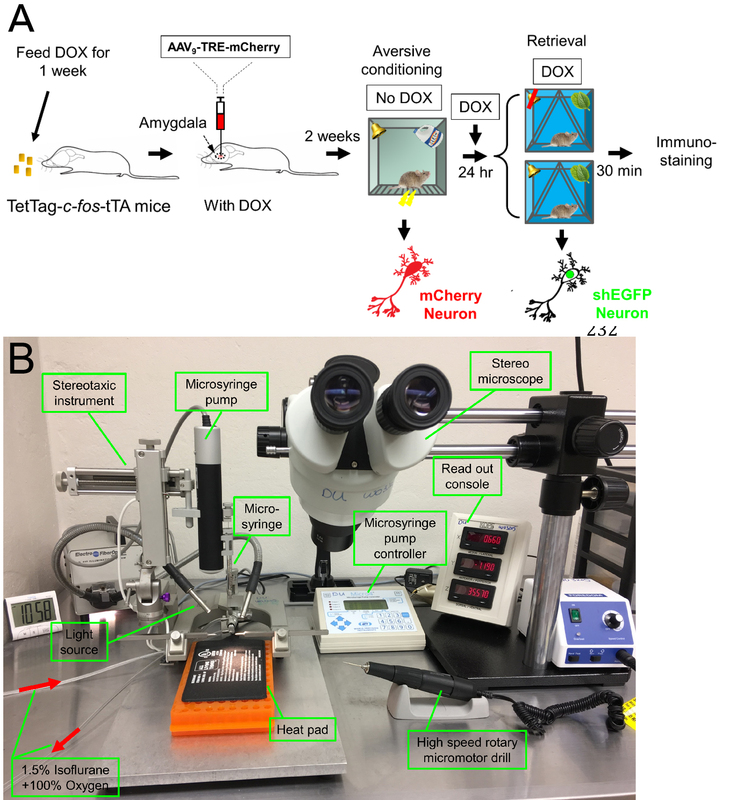 Twenty-four hours before the TetTag Fos-tTA mice injected with AAV9-TRE-mCherry undergo aversive conditioning, the Dox-containing diet is replaced by a regular diet. On day 1, mice are habituated to an infrared aversive conditioning chamber (Med Associates Inc.) for 9 min. Then, the mice are presented with six pure tones (80 dB, 2 KHz, 20 sec each). During the last 2 sec of the tone, they receive a foot shock (0.7 mA, 2 sec). The interval between tones is 100 sec. The mice are then returned to their home cage 180 sec after the experiment. Immediately after aversive conditioning, the Dox-containing diet is restarted. One day after the aversive conditioning, mice are put into a new context (Figure 3) and receive a retrieval tone or not. Figure 3. Contexts for aversive conditioning and memory retrieval experiments. To change the odor in different contexts, the chambers and floors are wiped thoroughly with 1% Bleach or 0.25% peppermint. Thirty minutes after retrieval, the mice are euthanized with an intraperitoneal injection of overdose ketamine/xylazine cocktail (0.2 ml/20 g mouse weight). Place the animal on its back on a dissection board, and pin out all four feet. Use a blunt-end scissors to open the rib cage and expose the whole heart. Hold the heart gently with blunt forceps. Hold the butterfly needle with hemostats. Insert the needle into the left ventricle (no more than ¼ inch). Note: Gently insert the needle and make sure the needle stays in the left ventricle. Turn on ice-cold PBS/Heparin solution perfusion (see Recipes). While supporting the heart with the needle and hemostats, snip the right atrium. Carefully unpin the front feet and skin flap. Continue the perfusion of PBS/Heparin until blood is invisible in the liver (more than 5 min). Note: Make sure blood is completely gone. Switch the perfusion from PBS/Heparin to ice-cold PBS/4% PAF. Keep running the PBS/4% PAF for at least 5 min. The mouse tail shows tremble when perfused with PAF efficiently. 4% PAF/PBS is not stable at 4 °C. Make a fresh solution from 20% PAF every week. Open the skull with scissors and forceps. Extract the whole brain using a metal spatula. Immerse the brain in 10 ml of PBS/4% PAF and store at 4 °C for 24 h.
The fixed brain is glued to the plate of the vibratome and rinse with ice-cold PBS. The brain is cut coronally into 50 µm sections from -1.54 mm to -2.34 mm anteroposterior. The settings of the Leica VT1000 vibratome: Speed: 4; Frequency: 5. Amygdala slices are identified according to a mouse brain atlas book (The Mouse Brain in Stereotaxic Coordinates, 3rd edition, 2008). Six coronal amygdala slices are microdissected from the brain slices using two 33 G syringe needles. Transfer the amygdala slices into a 24-well culture plate (one slice per well) by brush and wash for 5 min, three times in 4 °C PBS on a shaker. Note: The plate is covered with aluminum foil throughout the immunostaining experiment. Pipette 2 ml of blocking solution (see Recipes) into each well containing the staining basket. Place plate on a shaker at room temperature for one hour. Transfer each basket into a new well with 1 ml of primary antibody solution (see Recipes). Antibodies: Rabbit polyclonal IgG anti-RFP (Rockland) 1:1,000 dilution; Chicken IgY anti-GFP (Invitrogen) 1:1,000 dilution. Mouse anti-NeuN antibody, clone A60 1:1,000 dilution. Place the plate on a shaker in 4 °C for 12 h.
Transfer each basket into a new well with 2 ml of PBS on a shaker at room temperature. Wash for 10 min, three times. Transfer each basket into a new well with 1 ml of secondary antibody solution. Antibody: Alexa Fluor 488 Goat anti-chicken IgG (H+L) (Invitrogen); Alexa Fluor 568 Goat anti-rabbit IgG (H+L) (Invitrogen); Alexa Fluor 647 Goat anti-mouse IgG (H+L) (Invitrogen), 1:200 dilution. Place plate on a shaker at room temperature for one hour. Use a wide mouth pipet to transfer slices to the slide and remove the extra solution. Then apply 3-6 drop mounting solution (VectaShield HardSet Mounting Medium with DAPI) containing DAPI to the edge of the slice, and then cover it with a coverslip. Check the sample on a confocal microscope and store the slides in 4 °C refrigerator. Count mCherry-positive and shEGFP-positive neurons from 6 coronal amygdala slices (-1.54 mm to -2.34 mm anterioposterior) for each mouse. Co-localization of shEGFP and mCherry is analyzed by Imaris and ImageJ. Aversive conditioning labeled amygdala neurons with long-lasting mCherry and with a short-half life (2 h) nuclear-localized EGFP (shEGFP) (Figure 4). Immediately after aversive conditioning, mice began receiving Dox, which prevents expression of mCherry, but not shEGFP. Twenty-four hours later, we delivered a single retrieval tone or not. Thirty minutes after that, we harvested the amygdala and imaged shEGFP- and mCherry-positive cells (Figure 4). Compared to the control, a single retrieval tone increased the percentage of mCherry-positive cells that were also shEGFP-positive (Figure 4). These findings indicate that the retrieval cue reactivated neurons bearing the memory trace. Figure 4. Representative images of amygdala neurons that are labeled by mCherry after aversive conditioning and by GFP after retrieval as well as NeuN (blue). White dash line circles the area of the amygdala. White arrows indicate examples of colocalization of mCherry and shEGFP. mCherry- and shEGFP-positive cells are also NeuN-positive. Right, data are the percentage of mCherry-positive cells that were also shEGFP-positive. Data are mean ± SEM. n = 5 mice for each group. * indicates P < 0.05 by ANOVA with Tukey’s post hoc multiple comparisons. Note: 4% PAF diluted into PBS can only be stable for one week at 4 °C. We thank Thomas Moninger, Theresa Mayhew, and Sarah Horgen for assistance. We thank Drs. Susumu Tonegawa, Xu Liu, and Steve Ramirez for providing the TRE-mCherry plasmid and their previous works (Liu et al., 2012; Ramirez et al., 2013). JD is supported by the American Heart Association (15SDG25700054) and the University of Toledo start-up fund. Bruce, D. (2001). Fifty years since Lashley’s In search of the Engram: refutations and conjectures. J Hist Neurosci 10(3): 308-318. Josselyn, S. A. (2010). Continuing the search for the engram: examining the mechanism of fear memories. J Psychiatry Neurosci 35(4): 221-228. Liu, X., Ramirez, S., Pang, P. T., Puryear, C. B., Govindarajan, A., Deisseroth, K. and Tonegawa, S. (2012). Optogenetic stimulation of a hippocampal engram activates fear memory recall. Nature 484(7394): 381-385. Poo, M. M., Pignatelli, M., Ryan, T. J., Tonegawa, S., Bonhoeffer, T., Martin, K. C., Rudenko, A., Tsai, L. H., Tsien, R. W., Fishell, G., Mullins, C., Goncalves, J. T., Shtrahman, M., Johnston, S. T., Gage, F. H., Dan, Y., Long, J., Buzsaki, G. and Stevens, C. (2016). What is memory? The present state of the engram. BMC Biol 14: 40. Ramirez, S., Liu, X., Lin, P. A., Suh, J., Pignatelli, M., Redondo, R. L., Ryan, T. J. and Tonegawa, S. (2013). Creating a false memory in the hippocampus. Science 341(6144): 387-391. Reijmers, L. G., Perkins, B. L., Matsuo, N. and Mayford, M. (2007). Localization of a stable neural correlate of associative memory. Science 317(5842): 1230-1233. Ryan, T. J., Roy, D. S., Pignatelli, M., Arons, A. and Tonegawa, S. (2015). Memory. Engram cells retain memory under retrograde amnesia. Science 348(6238): 1007-1013. Silva, A. J., Zhou, Y., Rogerson, T., Shobe, J. and Balaji, J. (2009). Molecular and cellular approaches to memory allocation in neural circuits. Science 326(5951): 391-395. Copyright Du and Koffman. This article is distributed under the terms of the Creative Commons Attribution License (CC BY 4.0).